Courage to Resist believes that all military personnel have a moral and legal obligation to refuse to comply with any order that involves collaboration with [the following] immigrant concentration camps. 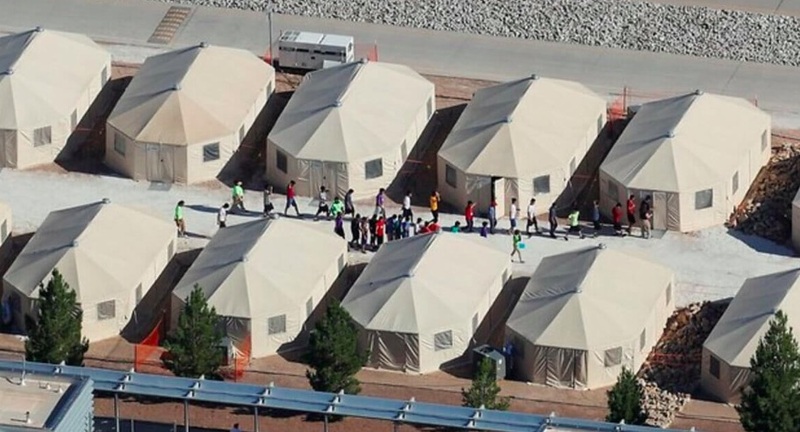 This isn’t the first time in US history that facilities are being constructed and used to imprison large numbers of a persecuted minority in a relatively small area with inadequate facilities (the definition of a concentration camp). Previous examples of this are now infamous, such as the so-called Japanese internment camps. We’re now on the brink of adding a new chapter to this dark history. Military officials, in response to pressured deadlines from the White House, have stated that these camps can begin to be operational by mid-August. Estimates are that capacity for another 10,000 people can be added each month. The White House’s stated timeline of 45 days out from June 27th has local base commanders scrambling and caught unaware. In addition to providing the land, military personnel will construct the camps while private agencies will manage the operations. While this simplified explanation of operations seeks to minimize the military’s role, it omits the endless capacities in which the armed forces will surely be facilitating the functioning of these camps such as with water, electricity, sewage, trash, and all of the other services to go allow with sustaining tens of thousands of immigrant detainees. Additional operational problems include the difficulty of housing persons in restricted access bases who legally need access to immigration and civil-liberties lawyers, secure areas to discuss their cases, as well as access for advocates, relatives, news media and political activists. Another issue is the lack of state licensing requirements, such as health and building codes, which military locations enable the government to avoid. As of July 10th, two weeks after the Pentagon confirmed that it was indeed working with the Department of Homeland Security (DHS) to construct these camps, there was still no Memorandum of Understanding with either DHS or Health and Human Services (HHS) nor could any timeline be stated for one. A memorandum would clearly delineate the roles and responsibilities of all parties. To move forward with construction plans without one, nor any clear legal guidance, certainly leads military personnel into dangerous waters for themselves. The military is strictly prohibited from domestic policing as stated in the constitution yet military personnel are being drafted into doing just that with this rising domestic enforcement of immigration policy. Just because Trump/Sessions Co. declares a war on immigrants, doesn’t make it an actual war. Being quite clearly an illegal order, the question is who will refuse to aid and abet? The Trump administration’s reckless leadership is currently putting military personnel in danger of running afoul of the law. While military personnel at all levels have a responsibility to refuse to participate in facilitating these camps, commanders in particular are at a particularly high risk in complying with these orders due to the precedent of the Nuremberg prosecution of those who aided and abetted Nazi leadership. Already the construction of one camp has been abandoned due to people’s refusal to look the other way. The proposed use of the Concord Naval Weapons Station experienced significant resistance and outcry from the community and local officials who opposed the plan once it was exposed via a leaked Navy memo recently published. DHS soon thereafter announced they would no longer build a concentration camp at this location. To follow that up, on July 10th the Contra Costa Sheriff’s Department announced it is cancelling its contract with ICE which facilitated the local county jails holding ICE-detained persons for a lucrative fee. These human rights victories have been happening in other communities as well including Sacramento County just last month. There are discussions and calls right now for counties to cease partnering with ICE, for communities surrounding military bases to refuse to work on the bases which will hold tens of thousands of people for the “crime” of seeking refuge. Share this article and discuss with others these facts as you ask yourself, what will I do? Now is the time to make a decision. The White House has requested that the first of these large scale camps be ready by mid-August. We are in the midst of a pivotal moment in history, one way or another.